Nearly 17 million prescriptions for tranquilizers are prescribed for older adults each year. 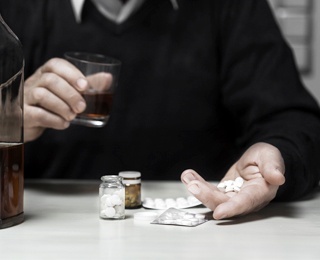 Alcohol and drug abuse is more harmful to older adults, because the risk of injury and harmful medication interactions are greater and the physical effects are more debilitating, the National Council explains. So, if the numbers are so dramatic and the danger is greater, why is drug and alcohol abuse among older adults often called the “hidden epidemic”? Older adults are often misdiagnosed because of their own attitudes and the attitudes of others. Abusers may feel shame and guilt and hide their behavior from family members and healthcare professionals. Family members may overlook the behavior, thinking their loved one is old and should enjoy their remaining time. Healthcare professionals may not take the time to do adequate screening and assume memory loss, confusion and other symptoms are related to existing medical or behavioral disorders. Many people have spent part or most of their adult lifetime drinking alcohol in moderation – 1 drink a day for women and 2 drinks for men (12 ounces of beer, 5 ounces of wine and 1.5 ounces of distilled liquor), according to the Centers for Disease Control and Prevention. Can being more connected prevent alcoholism and depression? But with age comes retirement and, generally, more free time and fewer responsibilities. Growing older can also be a time of change and loss, which can present coping challenges. A spouse or close friend dies, family moves away or downsizing becomes necessary. Driving, traveling and other activities become problematic, health concerns grow, sleep becomes more difficult, and pain medications are prescribed. These are all “potential triggers” for drug and alcohol abuse, according to the Addiction Center. C.S. started drinking in his mid-60s, after retirement and the death of his wife. He started attending Alcoholics Anonymous® meetings, became sober and lived into his 80s. Alcoholics Anonymous® offers thousands of free support groups throughout the United States, as well as helpful books and other materials. You can also talk to your family doctor, especially if your concern is drug abuse. Talk to a therapist who specializes in substance abuse counseling or enlist the guidance of a family member or friend. Are you or someone you know concerned that alcohol or drugs are a problem? Here is a short “yes/no” test from the National Council on Alcoholism and Drug Dependence to help you evaluate your concerns. Are you concerned about your health? We are, too. That’s why we offer information about health and fitness of interest to older adults. Contact us to schedule a tour to discover the many ways Kendal at Oberlin supports your health.